During the DIMDEX exhibition managing director of Barzan Holdings Nasser Al Naimi and CEO of Nexter and co-CEO of KNDS Stéphane Mayer announced the signature of two MoUs between their two companies. Following the signature of a letter of intent on the 7 December 2017 between Nexter and the Qatari ministry of defence (through Barzan Holdings, a company 100 per cent owned by the ministry of defence of Qatar) for a partnership around the procurement of VBCI for the Qatari forces (Al Rayyan programme), a Joint Venture has been established in Qatar and will be the local industrial base to deliver and maintain complete vehicles for the Al Rayyan programme. The first MoU represents a major step in the strategic partnership between Qatar and France, it will allow cooperation between Nexter, the French leader in land defence, and Barzan, a Qatari strategic industrial player. Together they will work to finalise the Qatari VBCI programme. Other common projects are under consideration to propose complementary solutions to the Qatari forces. The second MoU between Barzan Holdings, Nexter and all other industrial partners for the Al Rayan programme formalises the industrial cooperation and launches the contractual process. Stéphane Mayer underlines that Nexter is fully committed to provide operational equipment to Qatar. 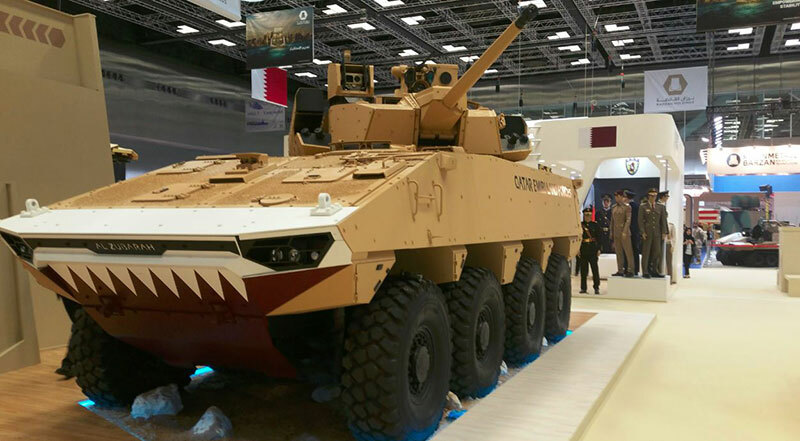 Two VBCI were displayed on the Barzan booth, one equipped with a 30mm canon and another one a Nexter 40CT turret on the Nexter booth on Barzan pavilion. Great write-up, I normal visitor of one website, maintain up the nice operate, and It is going to be a regular visitor for a long time.